We get lots of interesting/random/silly email threads around the office here at Media Molecule - and some are simply too good not to share with teh internets. So we thought we’d start a new blog feature, “Emails from the Molecule”. A few weeks ago one of our über programmers, Chris, sent this email around the office when he started to play around with some of the advanced logic tools available in LittleBigPlanet 2. 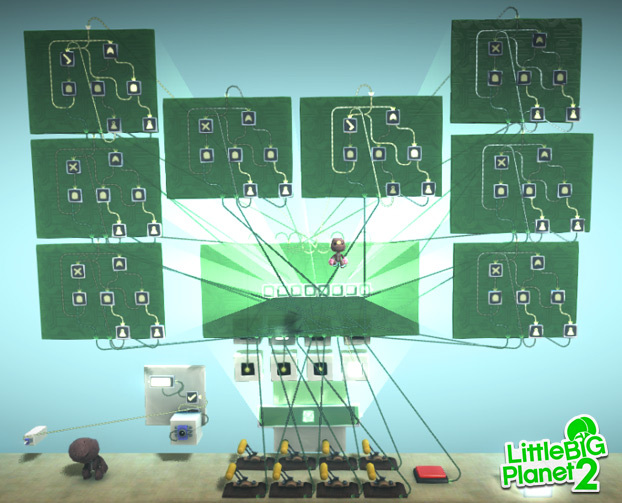 Subject: How powerful is LBP2 electronics? That’s an 8 bit parallel access store, typically used for mainting values locally in registers in CPUs. The key is that you set the values you want, jump on the button, and they get ‘saved’. Awesome! From there you can build integer units – crucially, all using a controlled store. Unlike the calculator level in LBP1, this allows you to create sequential instructions that operate on cycles – effectively a CPU, combined with indexable controlled store – aka ram. Plonk on top of that a grid of square lights…. aka pixels.